Today we present Sync.in - A realtime document conferencing tool. Sync.in is the simplest way to get your team on the same page. We have spent the last 9 years providing collaboration and communication technology to businesses of all sizes, from the energetic 3 member startup to the 100,000 strong Fortune 500’er. Amongst all the uniqueness of our customers, we have found various strong common needs. Cyn.in, our flagship offering is the perfect amalgamation of most of these. Cyn.in has been the most successful endeavor of Cynapse yet, and is growing at breakneck speeds. The ecosystem around Cyn.in of partners, developers and open source enthusiasts is increasing fast. Cyn.in is being used by some of the best institutes in the world, few of the largest NGOs in the world, governments, and thousands of businesses across the globe. One key need that we find commonly across many scenarios, however eludes Cyn.in: Absolute Simplicity. In all its depths of capabilities and features, Cyn.in sometimes does not provide for simpler, no-brainer solutions for basic collaboration and communication needs. We decided to build an offering that could fill this gap. Something that can deliver the key values of collaborative software yet remain dead simple to adopt and use. A tool that is fast enough to augment natural spoken communication. Part document editor, part instant messenger. Sync.in - the next generation communication and collaboration tool, is inspired from and based on Etherpad’s technology which was recently acquired and open sourced by Google. The slick collaboration tool consists of real-time web based Notes that users can create with a click of a button. You can invite your friends and colleagues to collaborate on the note. Multiple users can simultaneously edit the note and any changes are instantly reflected on everyone’s screen. In-built instant messaging with every note enables discussions to happen around the document being edited. The result - a new and productive way to collaborate and conference on text documents, useful for meeting notes, brainstorming, project planning, drafting sessions, training and a lot more. Sync.in blurs the line between the various methods of collaboration users are used to. Its fast and responsive. The user interface has been redesigned to make it much more intuitive. There isn’t much learning, infact its immediately obvious how to use - just start editing a note. Check out the video below to learn more about Sync.in. 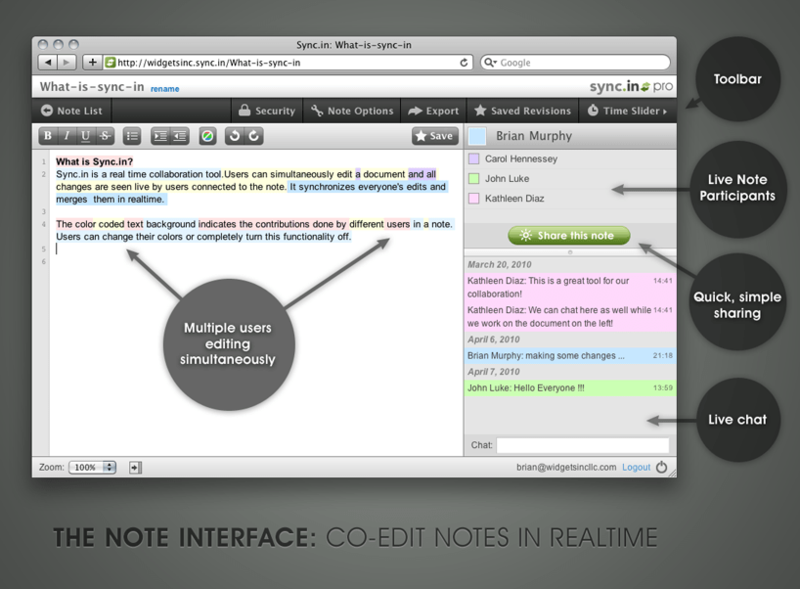 Groups of people working remotely can use Sync.in to brainstorm ideas or collaborate by creating a note. All participants present in a note are visible and their edits can be seen in different colors. If you have joined in late and missed out on all the live action, worry not! You can use the Time Slider to see the whole document evolve in an animated fashion. The conversation lives on. And on. Chat with active collaborators in real time. Chat history is maintained along with the note, creating an always persistent knowledge base for the note. A great way to know what decisions were taken and why. Invite friends and colleagues to co-edit notes easily by sharing the note link over Email, IM, Facebook, Twitter, Cyn.in, Delicious, Digg, Linkedin and other social networks via Ping.fm. Pro users with a team site can make notes public and invite external users to the note. The shiny AIR based desktop client enables you to quickly create and launch notes from your desktop, view the entire list of notes in your pro team site and even search for notes. All right from your desktop. Learn more about the Sync.in desktop client here. 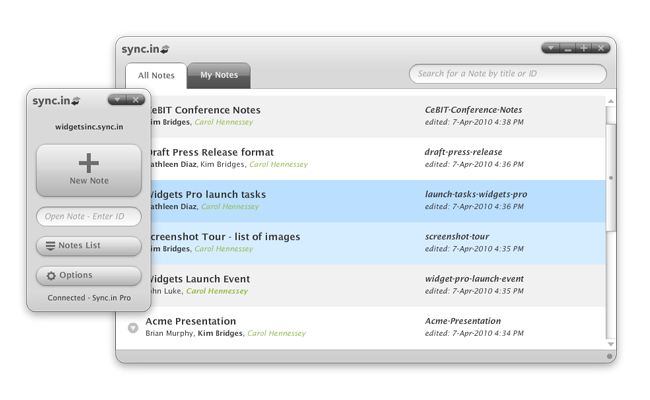 Lots more - These are just some of the exciting features of Sync.in. Check out the entire list of features of Sync.in here. Sync.in is free to use. You can create any number of notes without having an account with Sync.in. Simply go to the Sync.in site and hit the Create Note button and start collaborating! Sync.in Pro lets you create a site for your team or business in the cloud and is available at $2/user/month. You can start off with a 30-day trial to check out the Sync.in Pro features. We look forward to hearing your feedback about Sync.in. Share your features requests and usage scenarios with us and other Sync.in users. Your feedback and ideas are the top innovation drivers at Cynapse. And we’d appreciate if you would be part of shaping Sync.in - the next best thing to teleportation. Hope to see you around! I’d like to take this opportunity to congratulate Aaron Iba and his team on inventing and bringing the Etherpad technology to life. We love the Etherpad concept and have decided to adopt, embrace and extend the Etherpad vision and take it ahead. We have quite a few interesting ideas for Sync.in in the near future, so stay tuned.